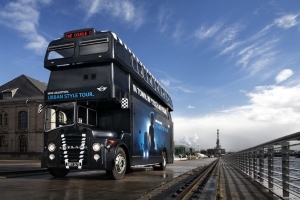 The World's widest range of double-deckers for sale, conversion and hire. Advertising, transport and hospitality all roled into one. Driving your marketing campaign direct to the market place. The LONDON BUS EXPORT Company. The London Bus Export Company. A unique enterprise dedicated to a unique vehicle. 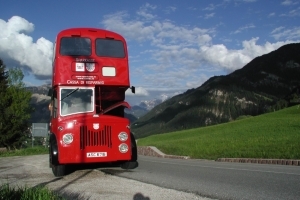 From the world's widest selection of double deckers, we can offer buses for sale and for hire, with a startling number of functions. To find out more about our london bus company visit our introduction. Our open top tourist buses and courtesy buses offer a different transport alternative for your tourist transport service or wedding transport needs. Our bus advertising and bus branding give countless business promotion opportunities. Having a bar on a bus or a restaurant on a double decker bus might sound like just the dining experience or entertainment transport you need. Children's fun buses are a great way to provide a kids party venue. Collectors classic london buses are a selection of classic london buses and classic collectors buses for the enthusiast. Our computer buses and IT buses offer a mobile IT centre for schools, education and corporate events. All our double decker buses are available as buses for sale or buses for hire.